Here is where you will learn about all the different types of beads that are available for your jewelry designs. If you are a beginner and just starting out with making jewelry, you might be wondering about all the choices of beads, materials, shapes and sizes. Scroll through our bead glossary below and it will all become clear. When I first started making jewelry, the trips to the bead store were fun but I always spent a small fortune on things, mostly because I didn't really understand what I needed and what was optional. Beading is a popular and growing hobby, and all the bead stuff and supplies that are available in the market can be a little bit overwhelming. You'll begin to realize that there are really only a few major bead styles and basic findings that will go into making a majority of your jewelry designs. And soon you'll be on your way to understanding and speaking jewelry lingo in no time. Your trips to the bead store will become more enjoyable and fun because you'll know exactly what you are looking for, and you'll probably also save money! If you're looking for deals on beads, be sure to visit the Jewelry Supplies pages, or the on-line community where I will share bead specials and coupons. Here is a list of the most popular bead shapes and styles available. 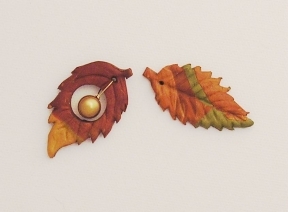 And, there are always new ones popping up, which keeps jewelry designing fun and interesting. Pick out a few of these bead styles for your next design, and use a little imagination to see what you can come up with. Bali beads, or "Bali style" beads are silver beads originally crafted from designs that are centuries old, in Bali Indonesia. But, due to the booming popularity of the jewelry bead market, these "Bali" beads are now made in many countires. These are handcrafted silver beads (not pure or sterling, as they are typically less than 93% silver) with intricate designs. 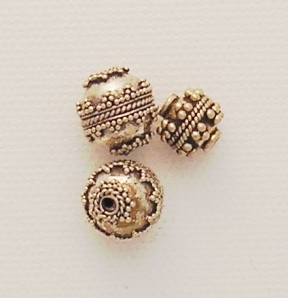 They come in a variety of spacer beads, bead caps, and focal designs, as well as ornate clasps and hook style closures. 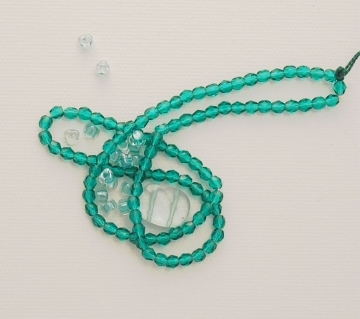 While they are certainly more expensive than plan glass or plastic beads, you can really spice up a boring design simply with the addition of a few well placed Bali beads. Give it a try and you'll see what I mean! Bead caps are generally silver beads (such as Bali) that are crafted in the shape of a cone so they will fit on the top or bottom of a round bead. They come in many intricate designs such as woven baskets, flowers, and more. Bead caps are wonderful accent beads. Try this simple design idea--take a pair of your favorite round beads (plastic, faceted glass or crystal) and slide them onto a headpin, then place a bead cap of the same diameter on top, and make a loop to attach to your ear wires. Voila! Instant designer earrings. 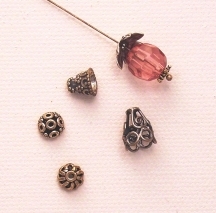 Spacer beads are used as accent beads in-between other beads to create more interest in a design. 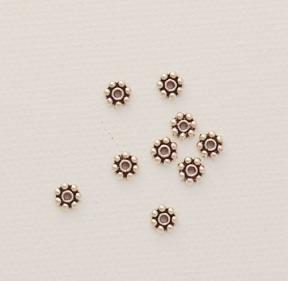 The most popular ones are Bali "daisy" spacers, little silver daisy-like discs that come in handy to create interest in any number of bracelet, necklace or earring designs. Simply adding a few spacer beads here and there will break up the monotony of your design, create some sparkle and interest. 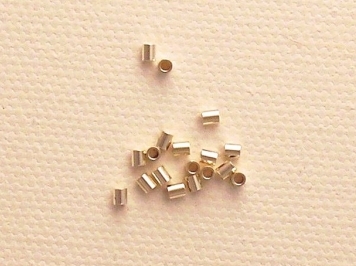 These a little metal tubes that are used to crimp and close off the ends of bracelet and necklace jewelry. The wire is threaded through the tube, looped onto the clasp, then back through the tube. The crimp bead is then flattened and closed with flat nose pliers or crimping pliers, holding the wire tightly in place. Chip beads are usually made from semi-precious stones, also sometimes called "gemstone chips". I have seen them made from everything from garnet, to turquoise, to amber. These are irregular, chunky uneven beads that come in many different diameters, usually somewhat flattened but smoothed on the edges for wearing comfort. Due to the freeform nature of these beads, they go well in casual designs. These beads also go great in natural, organic designs, such as a woodsy or nature-themed design, as well as in any casual design such as summertime jewelry. Faceted beads are simply beads that have been cut and polished to take on a sparkly eye-catching shine. Think of a cut diamond--all the "facets" catch and refract the light. They come in everything from plastic and glass, to real semi-precious and precious gemstones, quartz, and one of my personal favorites - Swarovski crystal beads! Use these beads whenever you want a little attention in your design. Mix them up with some smooth, non-faceted stones or pearls for more design interest. Hill Tribe Silver is handmade Thai silver made by artisans of the Karen tribe located in northern Thailand. They use traditional tribal methods to produce their silver designs, and they pass their knowledge down through generations. There are a wide variety of Hill Tribe Silver designs available, from unique clasps, to pendants and flower shapes, and other silver beads in every shape. These beads look great in earthy and rustic designs and with their unique appearance they can really become the focal point in any design. Lampwork beads are handmade glass beads. Because they are made by hand, these are often one-of-a-kind designs, and often come in creative dimensional designs such as with little bumps or swirls. Sometimes they even come in the shape of fishes, animals, or other creative objects. There are many excellent lamp work bead artisans out there producing some extremely beautiful and fine lampwork beads. On the other hand, sometimes you can pick up some perfectly acceptable mass-quantity lampwork inexpensively from Asia. It all depends on what you want in your design and what your budget calls for. Lamp work beads are often used as focal beads in your design, or when you want to make something really unique and special. A set of lamp work beads is also good if you want to make a theme bracelet, such as a beach-themed bracelet with ocean and sand-colored lampwork beads, with a sea themed charm or two attached to the clasp. I just love dichroic glass beads. 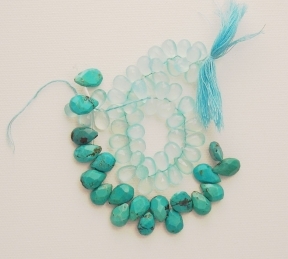 These beads are carefully crafted so that they transmit and reflect different colors. Like lampwork beads, dichroic glass beads are handcrafted and are usually one-of-a-kind designs (it's hard to get identical beads when melting glass!). 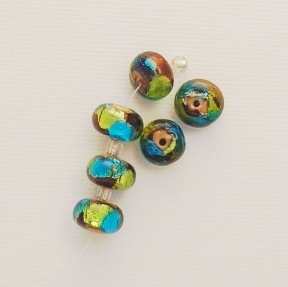 These beads are extremely eye catching and are usually made in mirror-like jewel tones. I think of opals whenever I see dichroic glass, as it has the same refractive, color-changing effect that changes with the angle of your perspective. Dichroic glass beads work well as focal beads in a pendant design, or choose a few matched dichroic beads to craft a special bracelet or earring set. 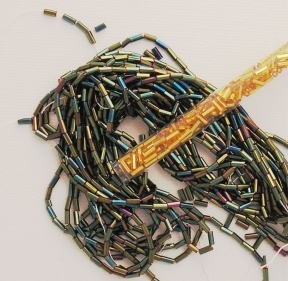 Foil beads are simply glass beads that are lined underneath with silver or gold foil. This creates a mirror-like, reflective quality. They are great as accent or focal beads in your design, as they really reflect the light and catch your eye. 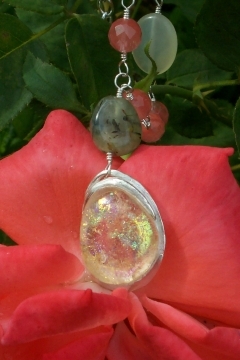 If you can't afford dichroic glass beads in your design, simple foil beads are a great alternative. Metal beads are made from any number of metal types, as well as a wide array of designs and sizes. Base metal beads are the most inexpensive variety, and these are great to use as accent beads as long as the wearer isn't allergic to nickel. Sterling silver beads are a great way to add instant class and a little pizzazz when mixed in with glass or stone beads. And of course, there are 14KT gold-filled if you prefer a gold look, or the real thing --14KT gold beads if you can afford them. Glass beads are a wonderful bead as they come in any number of colors, shapes, sizes and designs. Often they come with unique finishes and you can't always tell a glass bead from a more expensive crystal or gemstone bead just by looking. Also, glass doesn't irritate the skin and cause allergic reactions as some metal beads can, so these are a good option for anyone to wear close to the skin. 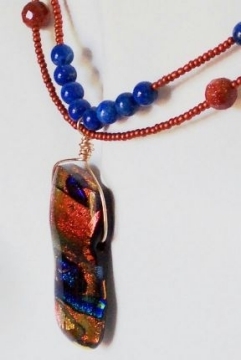 So, experiment with glass beads and see what you can design. Plastic beads also come in all shapes, sizes and colors. And, they are very inexpensive! So, these are great to use in jewelry projects for children, or when you just want a fun piece to wear that you don't want to spend a small fortune on. Wood beads come in many sizes, shapes and colors. 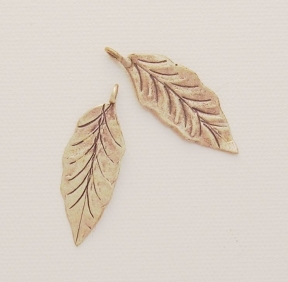 These are great for natural organic designs, or for summer jewelry. Sometimes they even come carved into ornate shapes and designs. 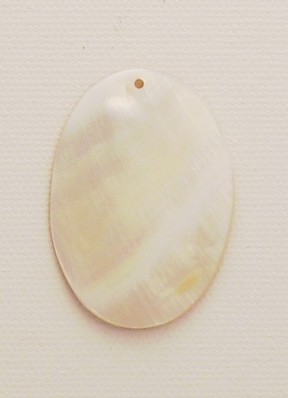 Shell beads are real seashells that have been cut and polished and turned into beads. These are great beads for summertime or casual bead designs. Mix them up with leather, or with turquoise or coral beads for interesting designs. 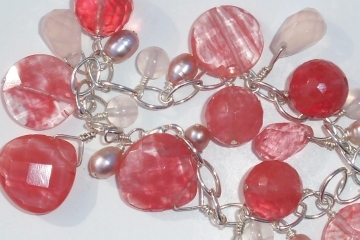 Often you can find nice mother of pearl focal beads to use in pendants. 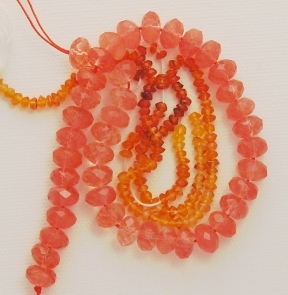 Coral beads have grown in popularity, especially for summer jewelry designs. Usually offered in the colors red, or pink, branch coral is polished and by adding a drill-hole--turned into beads. Like any natural material that is harvested from the ocean, due to the environmental concerns, there are many faux coral products out on the market now that made from plastic. 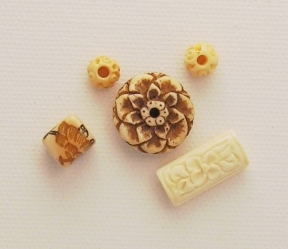 Bone beads are bone that has been refined and polished and turned into a bead. These are usually rustic in appearance and often used in an organic natural design. Less often used (harder to find and less desirable now due to the moral and ethical concerns around ivory poaching) is genuine ivory beads. Pearls! 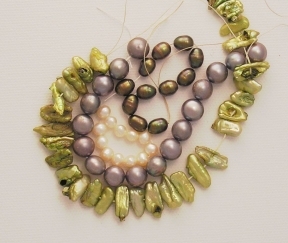 I use pearls all the time now, as there are so many wonderful fresh water pearls that are being made into a wide array of colors. They don't have to be expensive--it all depends on the quality, size and shape of the pearl, and where it originated from. Of course, if you are looking for high end South Sea pearls, you'll have to spend quite a bit more, but basic freshwater pearls can be had for a couple of bucks. 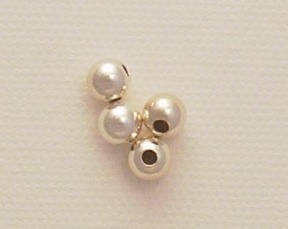 You can use pearls to add instant class to any design. Pearls are generally strung and knotted on silk thread, but they also work well on thin gauge headpins and thin diameter stringing wire. Note that due to the very small diameter hole in a pearl bead, you will need to choose a very fine gauge stringing material, or use a bead awl tool to enlarge the hole (but trust me, you don't want to have to ream out 100 pearls by hand, it will take all day!). Also, be aware that pearls cannot withstand harsh cleaners and silver dips, so you will need to be prepared to care for them with a soft cloth instead. 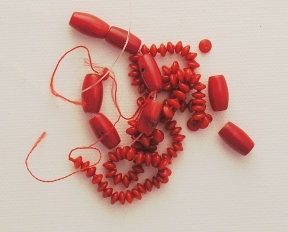 Vintage beads are simply older beads that are no longer manufactured. "Antique" is generally something thought to be 100 years old (or more). Since this gives these beads a certain rarity, they are often sought out by designers wanting to create a unique one-of-a-kind piece you won't find everyplace else. And they are sought out due to the special historical quality or nostalgia around anything vintage or antique these days. Here's an idea for you - seek out some vintage Swarovski crystal beads in unique colors or shapes that you can't find everywhere, and make a special set of earrings or a bracelet! 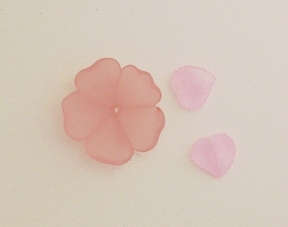 Polymer clay beads are handcrafted beads that have been made from polymer clay. Polymer clay is worked moist just like modeling clay or play dough, then it is baked to create a permanent hard bead. 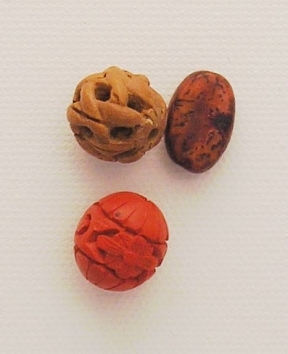 Polymer clay beads can be created in any number of colors, patterns and designs. These beads tend to be colorful and fun, so why not make up a couple of focal beads for your next bracelet? Precious Metal Clay (or brand name "PMC" by Mitsubishi Metals) and also the new "Art Clay Silver" start out much like polymer clay. It is worked moist as a clay form into any desired shape, size and texture. Then it is fired in a kiln or with a torch until it has hardened and cured into a piece that can be polished or oxidized to the desired finish. The end result is a 100% pure silver component or silver bead. This is a wonderful material that has opened many opportunities for jewelry designers who want to create special one-of-a-kind pieces but don't have the knowledge or materials to take on full-blown silversmithing. 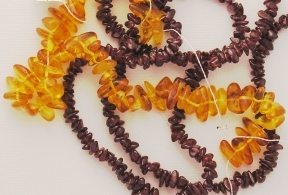 Seed beads are tiny cut glass beads that come in many common sizes. Seed beads are inexpensive compared to gemstone beads, and they come in a wide array of colors and finishes so you should be able to find one to meet your every creative need. Seed beads are often strung in groups of multiple strands for a necklace design. 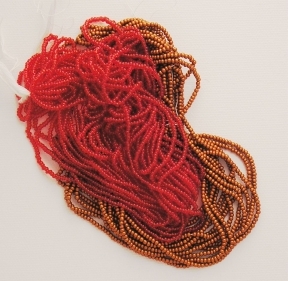 For designing, consider stringing one or more complementary or contrasting colors of seed beads for a more interesting design. Bugle beads are seed beads that come in longer tubes. And, just like seed beads, bugle beads come in an enormous array of colors and finishes. Mix them up in your designs along side seed beads and see what you can come up with for fun new design ideas. Rondelle beads are flattened round disc beads. These come in many materials and designs, including faceted glass, silver Bali and daisy designs, and semi precious gemstone beads. These are wonderful beads to mix into a design to break up the size and interest. For example, mix a rondelle in between every five round beads to break the monotony of the design or to create an accent. There's a reason that briolettes are my favorite bead! 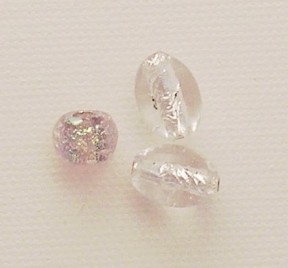 Briolette beads are teardrop, pear or drop shape beads that have been faceted to catch the light. They are almost always made from semi precious stones, such as garnet, amethyst, chalcedony, peridot, and more. Because of the material and time it takes to facet each bead, these are usually a little more expensive than plain glass beads, but when used appropriately in a design, well worth it! I absolutely love the classy elegance that a design takes on whenever I use briolette beads, and these designs are usually my best sellers because they are so special and unique. Briolette beads are especially fantastic when used as a matched pair in earring designs, or place one or more as the focal point in a necklace for an instant designer look. These are fairly self explanatory. These beads are usually made from glass or metal, and they are stamped or painted with a letter of the alphabet, a common word like "love" or "peace", or an Chinese word symbol like "double happiness". 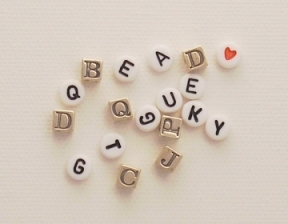 I love these beads because in no time at all you can crank out a custom personalized name bracelet, such as a mother's bracelet, grandma bracelet or friend bracelet, or even a tiny new bracelet for baby. Here's another ideas: Use the "word" beads by string them onto a headpin, and hang them as charms off a bracelet chain. Pick words to make a theme, and find a unique charm or clasp to finish your new treasure! These personalized jewelry bracelets make special gifts that show you really care.